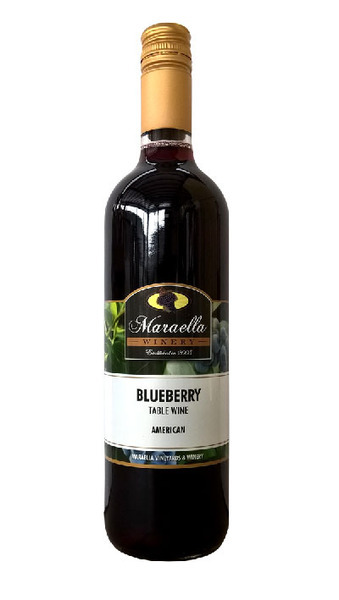 Maraella’s Blueberry wine is produced from only the highest quality Alabama and Mississippi blueberries in a process that maximizes color and flavor. Our blueberry wine is made with 100% blueberries with no flavoring or grape products added. Our Blueberry wine is a fruit-forward, light-bodied wine with alluring aromas and flavors of fresh blueberry cobbler. 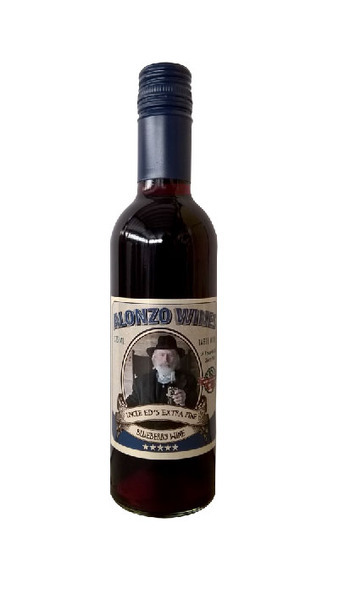 This 100% blueberry wine is fermented on its healthy skins to obtain the unique blueberry tannin structure. 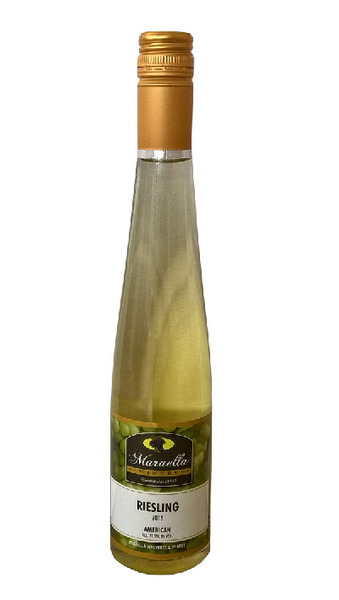 Maraella recommends serving chilled or as a mixer with one’s favorite Vodka. 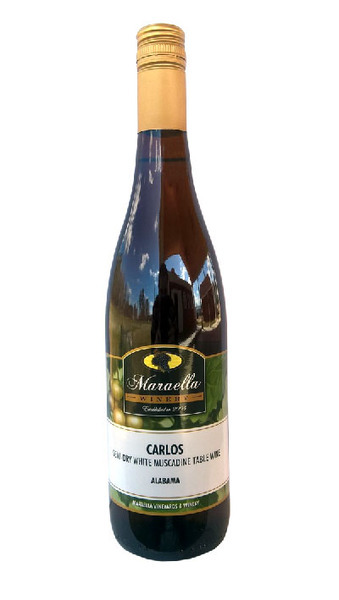 Maraella Winery’s semi-dry white Muscadine wine simply referred to as “CARLOS” is very light on the palate with hints of citrus, honeydew and green muscadines. The nose is a reminder of the Deep South on a beautiful summer day with inviting aromas of honeysuckle and melons. This wine finishes clean and light. Maraella recommends serving the Carlos chilled. 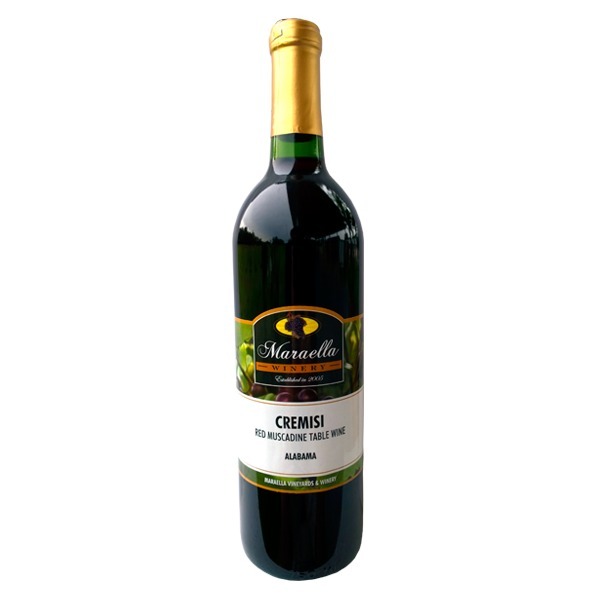 Maraella Winery’s Cremisi (Crimson) is derived from the Muscadine cultivar “Black Noble”, a red muscadine, “perfect flowered” fruit, grown in the Appalachian Mountains surrounding Hokes Bluff, Alabama. The nose is soft and sweet while the taste is full, lush, sweet fruit direct from the vine. Maraella recommends serving the Cremisi chilled. 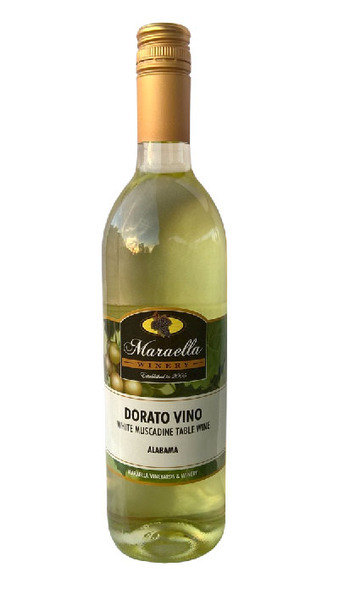 Maraella Winery’s Dorato Vino (Golden Wine) is derived from the Muscadine cultivar “Carlos”, a white muscadine, “perfect flowered” fruit, grown in the Maraella Vineyards in Hokes Bluff, Alabama. The aroma will remind many of eating the sweet fruit direct from the vine on a warm southern afternoon, while the finish taste will provide only a hint of sweet. Maraella recommends serving the Dorato Vino chilled. Maraella Winery’s 2013 Cabernet Sauvignon is made with Alabama’s only estate grown Cabernet Sauvignon grape. This unique handcrafted wine is ruby red in color. The aroma is sweet dark cherries. On the palate it gives a hint of pomegranate and finishes with an earthy oak taste. Maraella recommends serving the Cabernet Sauvignon at 68 degrees. 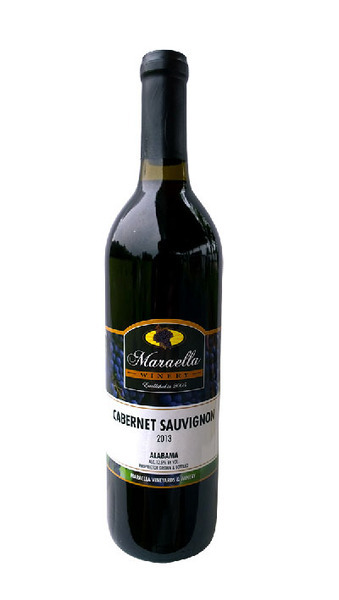 Maraella Winery’s 2013 Cabernet Sauvignon is made with Alabama’s only estate grown Cabernet Sauvignon grape. This unique handcrafted wine is a dark crimson in color. The aroma is sweet dark cherries with a hint of honey. On the palate it gives a delayed smooth tart cherry finish, so wait for it. 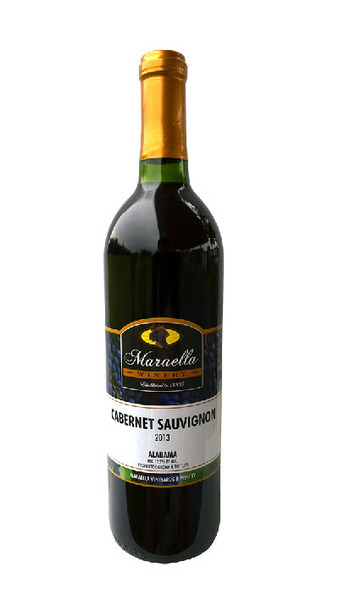 Maraella recommends serving the Cabernet Sauvignon at 68 degrees and allow it to breathe for 15 to 20 minutes. JSU Gamecock White is derived from the Muscadine cultivar “Carlos”, a white muscadine, “perfect flowered” fruit, grown in the Maraella Vineyards in Hokes Bluff, Alabama. The aroma will remind many of eating the sweet fruit direct from the vine on a warm southern afternoon, while the finish taste will provide only a hint of sweet. Gamecock Red Merlot offers softer tannins than Cabernet Sauvignon, but equal concentration and elegance. The aromas of black cherry, vanilla and toasty spice are intertwined with the fresh fruit flavors of cherry and currant which blends gently with vanilla and French oak. The wine is medium bodied, supple in texture, well-balanced on the palate, with a long, lingering finish. 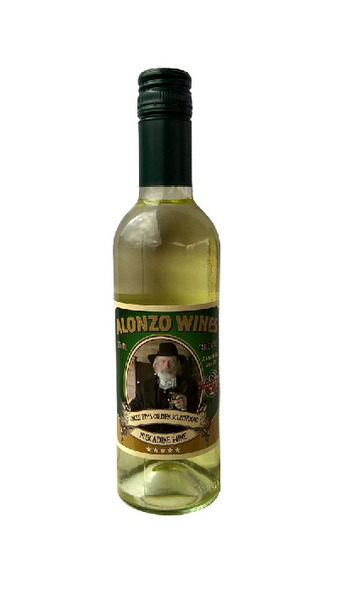 Its gentle balance of tannins and acidity make it the perfect companion to a grilled flat iron steak with blue cheese butter or pasta with sausage and roasted tomatoes. Has an aroma of blackberry, blueberry and pecan with hints of honeysuckle and dark chocolate to seduce and intrigue. The palate is inviting and silky, with a vivid core of Romanian oak that defines every sip, balanced by a backbone of acidity and a smooth tannin structure. This Bordeaux blend style wine’s never-ending, layered finish makes it enjoyable now or cellar worthy through 2030. Maraella recommends serving at 68 degrees and decant prior to serving to further accentuate the aromas and flavors. 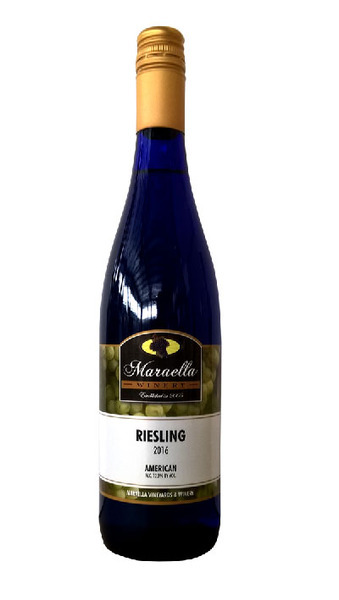 The 2016 Maraella Riesling offers pear and citrus aromas with subtle mineral notes. This vintage is made in a dry style with vibrant citrus flavors that finish off with a crisp acidity which makes it very versatile with seafood. Maraella recommends serving our Riesling chilled.